This evening, I decided to do some baking, otherwise, I'll totally lose touch with baking. I've wanted to use my bamboo charcoal since I bought it from Kitchen Capers a couple of months back. 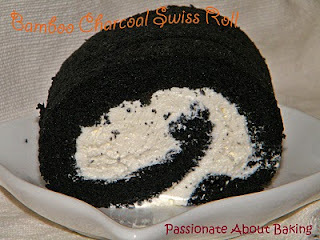 I knew I wanted to try Shirley's Bamboo Charcoal Swiss Rolls when I saw her post. It got preceded by other bakes that it was forgotten...until today. The cake turned out rather dry, but soft. I think I might have over-beaten the egg whites. However, when mixed with the fresh cream, it was still quite nice. Bamboo charcoal has this... weird and funny taste. The taste is like, when you burnt your tongue and upper mouth, and it leaves a coated layer on them. It tasted exactly like it. It leaves a layer of charred taste on the tongue. I just don't know how to describe this taste. I don't dislike it, neither do I love it. You just have to try it to experience for yourself! However, I do like this black... so cool, isn't it? I'm not daring enough to try bamboo charcoal. I also want to make this for the longest time! However I worry my kids are gonna freak out seeing the blackness and won't eat it, lol! When I made the charcoal bread it was really nice... But bread I am okay. :) very bold yet so curious to taste it!! This is very special. Can u taste the bamboo charcoal? Oooo interesting! 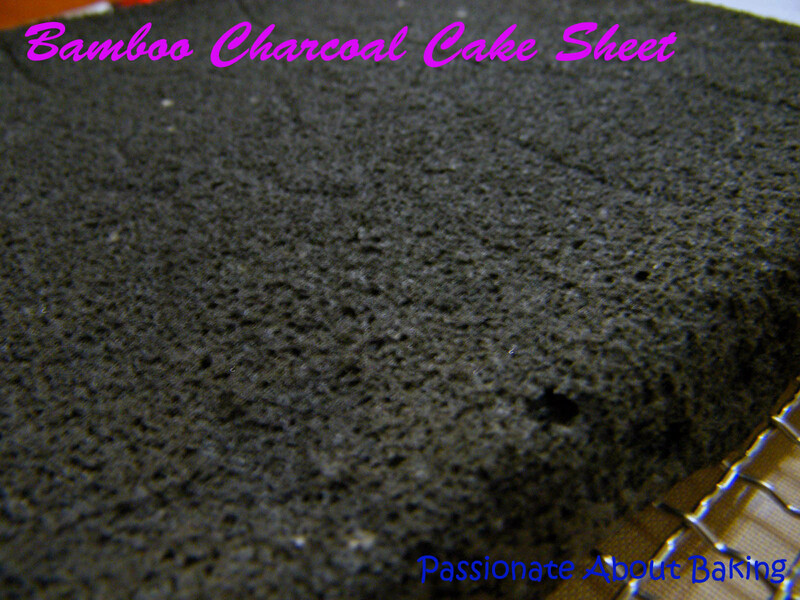 I too have a bamboo charcoal recipe queuing in my list..;p Hopefully I can share it with all of you soon. I had this in mind for months but just too lazy to bake it. Now you are motivating me. haha....this is quite funny - I couldn't taste the bamboo charcoal when I made mine. I wonder if I had stated too much bamboo charcoal in my recipe... This is one of those wierd things that people gets really fascinated by... Your swiss roll looks so much better than mine.... Thanks for the shout-out! very interesting way of making swiss roll. It look really good. 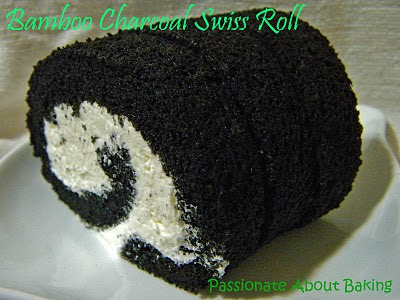 HBS, I shall try bamboo charcoal bread next! I can't wait for you to try bamboo charcoal and share with us! I still have one small bottle to try out! Thanks in advance! Very unique swiss roll! I'm very curious about the taste. Its black color roll looks cool indeed! Good try! Jane, the swiss roll looks cool, black beauty! Can i use norit instead? It's cheaper, charcoal, and also edible. But it's kinda medicine. I'm not sure what is norit. However, if it is in power form, you can try to replace it. Hope this helps.